I had spent enough time investigating the Bible to see that the writing style was more historical than allegorical or fanciful. Even though I seriously doubted that the stories in the Bible were true, I could see that whoever wrote the Bible presented the information as historical fact. It was as if the author of Exodus actually believed that what he wrote was true. 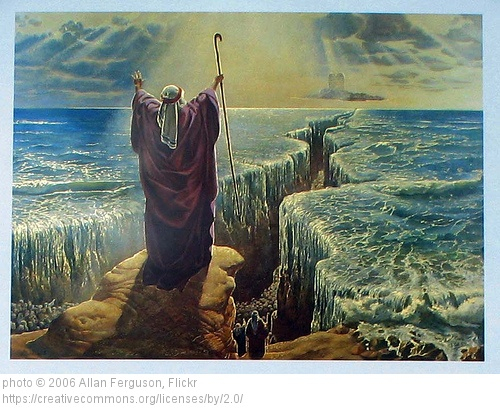 The story of Moses and Israel as told in the Book of Exodus did not paint Moses and Israel in bright, fancy colors. Some of what was recorded about them was dark and ugly. Even though I didn’t believe the story was true, I had to admit that the author did not try to sugarcoat the story. Moses looked weak and unsure of himself at times and the people of Israel looked to me like a bunch of losers at times. Why would someone make up a story about God and His people that made the people of God look so bad? Journalism is a discipline of verification. Evidence is found, tested and weighed for reliability. Truth is the objective and true objectivity is the goal. It’s a discipline because every journalist has personal biases, which is natural for being human. The discipline is to follow the journalistic method to the best of one’s ability and commitment so that truth is discovered, verified and reported with objectivity and fairness. A journalist’s first obligation is to the truth. Journalists who follow the discipline of verification want to talk with eyewitnesses, walk “the scene” of the story and pick apart every aspect of it, look at all the available evidence, research every possible way to look at the story, cover it from all sides. However, the task of personally interviewing eyewitnesses becomes impossible when those witnesses died hundreds or thousands of years ago. Verifying available evidence is also a challenge for journalists when the evidence is centuries old. The Bible’s version of Israel and Moses is one side of the story. What about other sides, like Egypt and Canaan? Did those sides have anything to say about Israel and Moses? For that historical information and verification we must turn to archaeology. Archaeology is “a science that deals with past human life and activities by studying the bones, tools, etc., of ancient people” (Merriam-Webster.com). The person who specializes in the study of the science of archaeology is known as an archaeologist. As with other scientists, archaeologists follow a scientific method that is continually evaluated and fashioned to improve the science and ensure the reliability of their findings. The archeological findings I studied in 1971 came from archaeological digs done in the 19th and 20th centuries. The scientific methods saw great improvement during the 20th century, giving journalists a better and more verifiable view inside the history of the ancient past. The Bible’s story about Moses leading the people of Israel out of Egyptian slavery presents God as the victor and Egypt as the defeated. In fact, the Bible presents the defeat of the Egyptian pharaoh as “destruction.” The Bible quotes the servants of the pharaoh pleading with him after the seventh of ten plagues in Egypt. How did Egyptian historians record the great destruction described in the Bible? I looked, but didn’t find much written about it. However, that wasn’t necessarily proof the events didn’t happen. Here is one perspective available to my investigation in 1971. How did ancient civilizations “report” their news? They didn’t have radio, television, magazines or newspapers. We didn’t even have the Internet and social media in 1971! The methods of “mass” communication thousands of years ago included fires, smoke signals, drums, horns, cave drawings, petroglyphs, pictograms, ideograms, writing (e.g. logograms, cuneiform, alphabet), carvings, art work and, of course, speeches and theatrical productions. The important thing was that people wanted to communicate and found lots of creative ways to do it. The famous British Egyptologist Sir Alan Henderson Gardiner translated an ancient document in 1909 that had been in the Leiden Museum in Holland since the early part of the 19th century. The Ipuwer Papyrus (Papyrus Leiden 344) became known as The Admonitions of an Egyptian Sage from a Hieratic Papyrus in Leiden. The following graphic comparison of the Ipuwer Papyrus and events recorded in Exodus is courtesy of Ohr Somayach Institutions www.ohr.edu. 2:5-6 Plague is throughout the land. Blood is everywhere.2:10 The river is blood.2:10 Men shrink from tasting – human beings, and thirst after water3:10-13 That is our water! That is our happiness! What shall we do in respect thereof? drink of the water of the river. one dead.12:30 …there was a great cry in Egypt. of fire, to give them light; to go by day and night. Israelites] thus drained Egypt of its wealth. While there are similarities between the two documents, there are also disagreements among archaeologists about which document was written first. Ipuwer has been dated between the 19th and 17th centuries B.C. (approximately), while Exodus has been dated between the 15th centuries and 14th centuries B.C.(approximately). If Exodus was written before or about the same time as the Ipuwer Papyrus, then there is the possibility of a connection between the two. However, if Ipuwer was written first, especially if by centuries, the connection seems improbable. While not a slam dunk to my investigation, I did find the evidence interesting and worthy of notation. The next question on my mind at the time was whether a nation of slaves could have escaped from captivity and wandered in the wilderness for 40 years before conquering established city-states in Canaan. Be sure to join me for the next chapter of Convince Me There’s A God.